It’s summertime and the livin’ sure is easy on the Granite Belt in Queensland’s high country. Now that the busy Christmas and New Year period is drawing to a close many are enjoying some well-earned downtime and relaxation whilst pondering their plans for 2019. The Granite Belt certainly delivers no matter what the season but this time of year is especially delightful. Whilst January is perhaps best spent exploring on foot (working off the foodie indulgence of Christmas), and for those that love a good cocktail keep your exercise up because on 19 January Cocktails on the Green is the event for you. The highlight for January is surely the 2019 Australia Day celebrations. If you choose to celebrate then there are options at Stanthorpe’s Weeroona Park and also in Warwick. Head over to the Southern Downs website for details. February sees the return of the popular and much anticipated Stanthorpe Show at the Stanthorpe Showgrounds from 1-3 February. Steam train buffs can enjoy a train ride to Wallangarra and return on 9 February. Explore the historic Wallangarra train station and have fun with one foot each in Queensland and New South Wales at the same time. Tickets are available at the Southern Downs Steam Railway website. Dreaming of being a winemaker? Well, February 23 and 24 are the dates for you. Winemaker for a Weekend is on at Queensland College of Wine Tourism. There you will spend an amazing weekend with a complete, ‘hands-on’ winemaking experience, served with delicious meals and matched wines. Cyclist’s rejoice! The charity event, That Dam Ride is on again for another year on 24 February, taking you throughout the scenic Granite Belt ending at Storm King Dam. The have catered for all levels of cyclists with a 125km main ride, a 70km challenge, 45km intermediate or 20km ride for beginners, kids or the whole family. With just a few days until the official start of spring, it’s timely to take a look at what’s on in Stanthorpe and surrounds over the next couple of months (to end of November 2018). Whilst you’ll no doubt still enjoy the cool weather and might choose to stay snuggled up in front of the fireplace with your loved one, there are certainly some delightful dalliances to be had and places to explore. 6-9 SEPTEMBER If you love arts and culture then The Peter Allen Festival might just be your thing. It’s just one week away and located in Tenterfield which is less than an hour from Stanthorpe. At Alure Stanthorpe, we understand how hard it is to get away. However, life is too short not to reward yourself and spend special time with your loved one. So book a truly romantic escape for two in your backyard at Alure; home to Australia’s most luxurious glamping tent and two stunning villas. Watch the milky way with a glass of Granite Belt wine in your private outdoor heated spa. Can’t leave home without your well-loved pooch? Our pet-friendly villa comes complete with a doggie bathrobe and gourmet doggie treats. Residents only: please present your driver’s licence on check-in. Minimum 2 nights. Midweek Escape Special – STAY 3 NIGHTS PAY FOR 2! 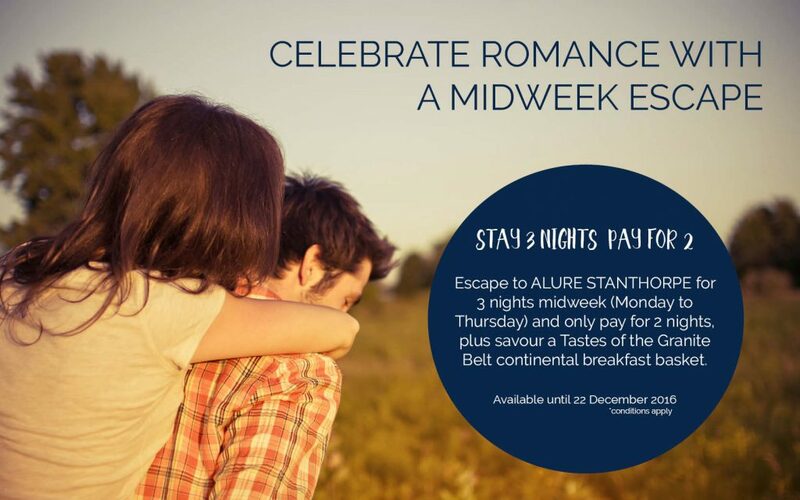 Celebrate romance with a fabulous Midweek Escape Special at Alure Stanthorpe – STAY 3 NIGHTS PAY FOR 2! We are all about romance and reconnecting with the special person in your life. Escape the coastal humidity at Alure for 3 nights midweek (Monday to Thursday) and only pay for 2 nights. Valid until 22 December 2016. Our Midweek Escape package also includes a scrumptious Tastes of the Granite Belt continental breakfast basket. Book some romance in your life now! Have you been dreaming of a luxury getaway and pet-friendly accommodation in the heart of Granite Belt Wine Country, where after a full day of exploring and sniffing, you can stretch out by the fire, or end the day stargazing in your own private courtyard? • With your sunny disposition that you use an ‘inside voice’ so as not to disturb other guests. • You resist the temptation to climb on the furniture, or sleep on the bed. • You only use the outside toilet facilities and would never mess inside. What about your humans? Do they…? • Keep you safely on a leash when outside to protect you from native animals, or from getting lost? Foxes might find you very tasty and you certainly don’t want to get lost while enthusiastically exploring the natural bushland. • Pick up your outside er… messes? Bathroom facilities are located outside your villa and Alure provides doggie bags. There is just one pet friendly villa and prior approval is required. Alure Stanthorpe will provide for your enjoyment, your very own plush bed, food and water bowls and a gift bag of toiletries & gourmet treats. An unlikely romance of the four-legged variety is blossoming at an exclusive retreat for couples nestled amongst tranquil bushland and boutique wineries of the Granite Belt. Ms Marion Carrick, co-owner of Alure Boutique Villas, says the unusual relationship is emerging between a resident sheep and pony is set to rival any other animal love story. “We have so many beautiful love stories from the couples that stay with us and now we have our own, between Monty the sheep and Bek the pony,” said Ms Carrick. “They stand shoulder to knee, but as is the case with true love, their difference in size does not deter this romantic couple from seeking each other across the paddocks of our retreat,” she said. Bek is a 9 year old Royal Champion Welsh Mountain pony and Monty is a 3 year old purebred miniature Babydoll Southdown ram standing around half her height. Ms Ruth McLennan, Marion’s mother and co-owner of Alure Boutique Villas, says most animal love stories seem to occur between two that are in enclosures alone, with no other animals of their species nearby. “What makes this romance different is that Monty is paddocked with 16 other sheep, yet he still chooses Bek,” said Ms Carrick. “It’s very Romeo and Juliet, and our guests marvel that love really does come in all shapes and sizes,” said Ms McLennan. The beautiful Granite Belt, with Stanthorpe at its heart, is a romantic paradise waiting to be discovered. 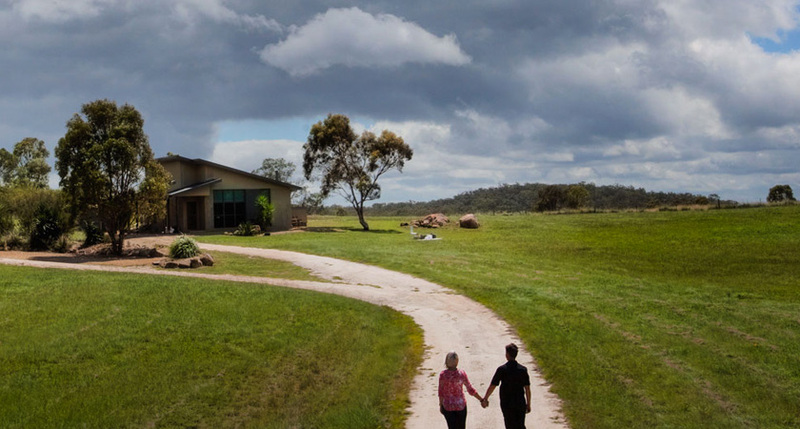 Did you know that there is a whole host of romantic things to do in Stanthorpe? With its amazing food, views and secluded luxury, it’s a hot spot spark the flame of romance in your relationship. Here are some resources to plan a fairytale romantic weekend away from Brisbane and its surrounds. It’s been said the way to a person’s heart is through their stomach. The Stanthorpe region has many great places to test this theory. There are plenty of things to excite your tastebuds in Stanthorpe! The Bramble Patch at Glen Aplin offers fare made from berries grown on the premises – fortified berry wine, preserves, with desserts and coffee too. Mt Stirling Olives at Glen Aplin is olive heaven, with plenty of olive products available for sale from oil to tapenade and even olive trees for you to take home and grow your own. Heavenly Chocolates at the edge of Girraween National Park propose a cup of European hot chocolate in choice of 18 flavours as well as hand crafted chocolates. Heavenly Chocolates is open Friday to Monday as well as public holidays. For a more substantial meal Patty’s On McGregor serves a wonderful standard Australian cuisine menu featuring culinary art from various other cultures – with divine desserts. The quaint BYO (no corkage charge) restaurant is very popular and can book out early, so let us call them to make a reservation for you. Don’t feel like eating out? At Alure Boutique Villas we offer several dine-in options for our guests to enjoy. A personal chef can be yours for the evening and can design a six course menu to your tastes. Or if you prefer to cook for yourselves we offer a Gourmet BBQ pack with generous servings of appetisers, entrée, main and dessert. Contact us for more details when you book. The Granite Belt is known worldwide for its wines, with most wineries in the area opening a cellar door where tastings are available and purchasing wine is hard to resist. Follow the Strange Bird Trail to visit 21 cellar doors offering wines made with alternative grape varieties. There are over 40 cellar doors and 55 vineyards in the area, catering to all palates. If beer is more to your taste the Granite Belt Brewery in Stanthorpe is not to be missed. Tours can be booked by your accommodation or at the visitors centre so you can taste the drinks on offer and not have to worry about driving over the legal limit. Or if you prefer non-alcoholic drinks Suttons Juice Factory and Cidery at Thulimbah offers many types of apple juice and cider. There are plenty of beautiful places to see in Stanthorpe. After a hard day of gourmet food and wine tastings, you’ll have plenty of lovely things to pack in your picnic basket for day two of your romantic escape to Stanthorpe! Alternatively we offer a Gourmet Picnic Hamper for two, perfect for lunch. Head to one of the local National Parks where there are numerous walking tracks to be alone with nature and your loved one. Girraween National Park at Ballandean has much to offer with a visitor information centre adjacent to the Bald Rock day-use picnic area with tables, toilets and barbecues available for use. The unusual landscape is accessible by several walking tracks to various natural formations of creeks and granite rock. Walking tracks are graded by difficulty and distance. Shopping is not one of the most romantic things to do in Brisbane or the Gold Coast but here in Stanthorpe, shopping is about pottering around taking in local crafts, antiques and, of course some fashion and shoes, a girl’s gotta live. Why not spend a leisurely afternoon browsing in town and then take in a little culture. “Markets in the Mountain” is held every second Sunday in Stanthorpe Civic Centre. Stanthorpe Regional Art Gallery in Lock Street, Stanthorpe contains almost 900 permanent works on a wide range of contemporary subjects. Exhibitions and events vary. Art Works on Davardi is a community Art and Craft Gallery, with a reading area and coffee shop. Works on display (and sale) are by local and regional artists. This gallery also holds many workshops and an “open mic” afternoon on the last Saturday of the month for local musicians or poets. Romance that ends in the bedroom – oooh la la! There’s nothing more romantic than a beautiful view, beautiful accommodation and some fabulously secluded private time! 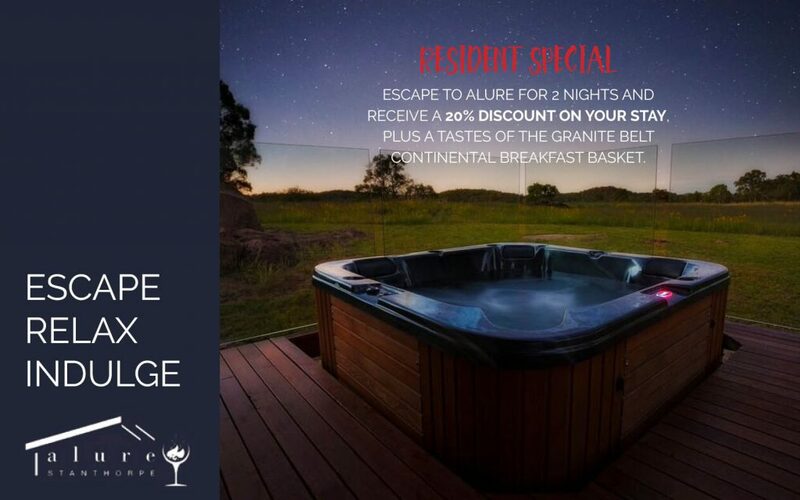 Alure Boutique Villas are designed for couples only, with a choice of two beautifully appointed villas or a luxury five star tent for some en vogue Glamping, Stanthorpe Style! Each villa or tent has a deluxe king sized bed with an ensuite, fully equipped European kitchen and private heated outdoor spa for soaking in the view. If it’s a very special romantic occasion (we get our share of questions popped) call ahead for some VIP romantic touches to your room. There are plenty of things to do in Stanthorpe – it’s a town unlike any in all of Queensland (and we think all the world!) but for couples, it’s a special destination for a weekend escape from Brisbane or South East Queensland. So close, and yet a whole lifestyle away. Stanthorpe weather is unique among Queensland towns because, with the state’s coolest temperatures, every season offers something quite unlike anywhere else! Stanthorpe and the Granite Belt are beautiful whatever the season, whatever the weather. There are lots of things to do and here are some great seasonal activities to try on your next visit. Temperatures can vary significantly in any season, so best advice is to dress in layers. Despite Stanthorpe being Queensland’s coolest town, temperatures can still occasionally reach the low 30 degrees Celsius range during the day in summer, and often down to below zero at night in winter. Luckily we have nice and cosy villas and our luxurious five-star tent to accommodate you. Temperatures average from a maximum of 22.3 degrees and 7.8 degrees minimum. Spring is wildflower season at Girraween National Park on Pyramids Road. The best time to see the wildflowers in bloom is late September into October each year. The contrast of delicate colour against the stark granite can be viewed from the many walking tracks through the park. The flowers attract many local wild animals as well – be on the lookout for wombats, wallabies, lizards, birds and insects. A swim in the water hole will refresh you ready for your next adventure. The region’s produce season is starting with many farm gate shops starting to sell their wares. Much of the region was founded by people with European heritage, and each year this is celebrated in true ‘Primavera’ (Italian for ‘spring’) style with various cultural and culinary events in almost every vineyard and attraction in the area. Let us know your interests and we can help you choose from the myriad of events on offer, including (but in no way limited to) Jazz and Wine events held by Robert Channon Wines (Bradley Lane, Stanthorpe) throughout the season and “Shakespeare Under The Stars” at Bungawarra Wines, Bents Road Ballandean in early November. Summer temperatures reach an average of 28.8 degrees Celsius maximum and 14.6 degrees minimum. Summer is a busy time in Stanthorpe. The warmer weather means fruit picking is in full swing, with fruits such as berries, apples, pears, stone fruit (cherries, peaches, plums, nectarines, and apricots) and rockmelon are available. Vegetable lovers are in for a treat with a wide range of these available also. Pick your own fruit farms and farm gate sellers abound along Granite Belt Drive, accessible from the New England Highway. One shop not to miss on this road is Sam’s (The Summit Fruit Shop). They buy direct from the farmers and even accept major credit cards. Strawberry Fields on the edge of town at Stanthorpe is a must-do for pick your own strawberries and a great café. The Bramble Patch, Townsend Rd Glen Aplin, is another must if you enjoy our breakfast basket – they supply the jam and berry compote. It’s a nice place to stop off for ice-cream and waffles on a sunny day. They also sell 60 different products including sauces, jellies, marmalade, coulis, chutneys and other preserves. You are sure to find something to take your fancy! Golden Grove Estate hosts a Sicilian Vintage Lunch in February each year to celebrate the beginning of the vintage. Traditional Sicilian fare, the blessing of the first grapes harvested, followed by a grape stomp! What a great afternoon! Commercial lavender farm Crystal Ridge Lavenders harvests lavender during December and January and sells lavender products like soaps and lotions, but also lavender chocolates and biscuits. Find them on Daniells Lane Stanthorpe. Fishing at Storm King Dam, accessible via Nielsens Road Eukey, is best in the summer. You will need a permit to catch Murray Cod, Yellow Belly (Golden Perch), Silver Perch, Spangled Perch and Eel-tailed Catfish. Size and catch limits apply also. Stanthorpe weather is starting to cool down with maximum temperatures averaging 21.9 degrees Celsius and minimum 8.8 degrees. Autumn is the season for golden vistas among the vines. The 40 cellar doors and 55 vineyards are starting to harvest their grapes for new vintage wines as the leaves turn golden. Ballandean Estate Wines (Sundown Road, Ballandean) in conjunction with the Rotary Club of Stanthorpe holds a charity event “Opera in the Vineyard” on the first Saturday of May each year. This event attracts around 2000 people and is open for booking from January. Lunch and dinner are available as well as the opportunity to experience one of South East Queensland’s premier cultural events. “Art in the Mill” at Ballandean Case and Timber Mill, Curr Road Ballandean is another great event on the first weekend in May each year. It showcases local art and is a great opportunity to socialise (with a glass of mulled wine) by an open fire – handy as the weather starts to cool down. Not into wine? Sutton’s Juice Factory and Cidery, on Halloran Drive Thulimbah, have a juice factory, cidery, distillery, home style café and open the orchard for ‘pick your own apples’ from February to June. We like their juice so much we include it in your breakfast basket for you to enjoy. Or you could soak up the view at Mount Marlay (pronounced “marlee”) with a stunning lookout over the township of Stanthorpe. The lookout is located on Lock Street. Why not visit the regions only dairy farm and appreciate the cheese platters and local wines on offer or sample a great coffee and cheesecake, at Stanthorpe Cheese, corner Amiens Road and Daniells Lane Thulimbah. Make sure to pack your woollies – overnight temperatures can drop to an average of just 1.8 degrees Celsius, but rise to a brisk 17.2 degrees during the day. There is an average of 14.3 nights of zero degrees or less in July so warm clothes are a must! Our villas and tent are built to keep out the cold, and each has their own open fire to keep you toasty warm. Winter is “brass monkey season” – for a reason. Are you ready for this? It snows in Queensland – only in Stanthorpe! Snowfall is not unheard of in the area, with overnight frosts common, so why not take the opportunity to rug up and find a great open fire, there are plenty around! The Bramble Patch offer a range of award winning products like blackberry and apple pie, why not enjoy it next to their fire. Christmas in July events are available in many local restaurants, with the cooler weather being perfect for the traditional hot dinner. Vegetables in season now are broccoli, Brussels sprouts, cabbage, cauliflower, celery, leeks and mushrooms. Stanthorpe weather is quite unlike anything you’ll find anywhere else in Queensland and it’s the ideal weekend escape for Brisbane, Gold Coast, Ipswich, Toowoomba and other South East Queenslanders! A Story of Romantic Getaways…. This is a story about a couple who came to us for a romantic getaway from Brisbane on Valentine’s Day. It could be anyone’s story. It could be your story this Valentine’s Day. Either way, we’ve heard this story many times before because we’re one of the most romantic destinations for couples, Valentine’s Day or not! Here’s how it goes… He was very particular when he called to make the reservation. He checked on all the details over and over. Yes, your romantic escape will include rose petals and candles and bubbles and chocolates… Yes, it’s a private sanctuary. Yes, we think she’ll love coming here for a Valentine’s Day surprise. When they checked in, she was so excited, she asked all about the local wineries, the view, the must-see sights in the area and all the fabulously romantic places to dine locally. He looked, well, very, very nervous, almost a bit pale. She was giddy with happiness at the magnificent view and all those perfect Valentine’s Day touches that her boyfriend had requested be ” just right” for a very special occasion. So did he propose on Valentine’s Day? Well, now that depends, after all, this could be your story! It could be your romantic Valentine’s escape. It could be your candlelit bubbly and chocolate and rose petal proposal that you’ll tell your children about some day… or it could just be the most romantic way to spend a Valentine’s Day, no ring required, it’s your story, tell it your way! Maybe you’ll be proposing, maybe you’ll be proposed to, maybe you’ll just have a relaxing weekend away, spoiled with all those little extras. Whether your escape to The Granite Belt comes with a ring or not, it’s a definite winner for a romantic getaway. Check out our Valentine’s Day packages now. Officially Queensland’s coldest town, Stanthorpe is definitely the cool place to be this summer. Our warm, sunny days lack the high humidity of the city and make it enjoyable to get out and enjoy the many enticements that Stanthorpe in summer has to offer. During the day, Stanthorpe’s summer temperatures are, on average, 5 to 7 degrees cooler than Brisbane. Overnight, our temperatures can be up to 9 degrees cooler. The Granite Belt is a great place to delight in outdoor pursuits, even in the peak of summer when the days are warmer, as the humidity is so much lower than Brisbane. Perfect sunny skies are often followed by clear nights, perfect for star gazing. The best way to fully experience the Granite Belt in summer is to pack a picnic lunch full of fresh local produce and cool off in a tranquil stream in Girraween National Park. Or you might prefer taking a walk along the many creek banks of the area, enjoying a relaxing pace and soaking up the spectacular landscape. When all of these options become too taxing, you could simply enjoy the view from your Alure Boutique Villa. Amazing stone fruits and berries are harvested throughout the Granite Belt every summer and the juiciest grapes are getting plumper for wine making. Summer in Stanthorpe sees the production of some of the most delicious berries, apples, pears, rockmelon and stone fruits in Australia, as the mild temperatures are ideal for growing. Beds of fragrant lavender and gorgeous roses are a constant hive of activity with bees and butterflies, offering many ideal photo opportunities amongst the blooms. Keep an eye out for the bright yellow coreopsis and the lovely pink and white cosmos flowering on the roadside and in the orchards. It truly is a beautiful sight to see the wildflowers in bloom in the summer in the Granite Belt region. End your summer day of touring the Granite Belt with a spot of stargazing and a glass of local wine. Enjoy the warm, soothing bubbles of your private spa hidden discretely in your Alure Boutique Villa’s secluded courtyard and feel the daily stresses of city life leave you behind. We’d love for you to escape the heat and humidity of the city, to indulge in luxury accommodation at Stanthorpe in the heart of The Granite Belt. Come and experience the Granite Belt’s incredible natural summer attractions for yourself.